WHAT’S NEW? — 2.0 by Jim Corbran, Automotive Columnist A few more new model introductions from this year’s just concluded North American International Automobile Show in Detroit: 2017 Buick LaCrosse — the LaCrosse was touted by many as a Lexus competitor back when Buick introduced the newly restyled 2010 models. I always thought it looked like it spent too much time at the buffet table. This time around I think Buick has hit the nail on the head. 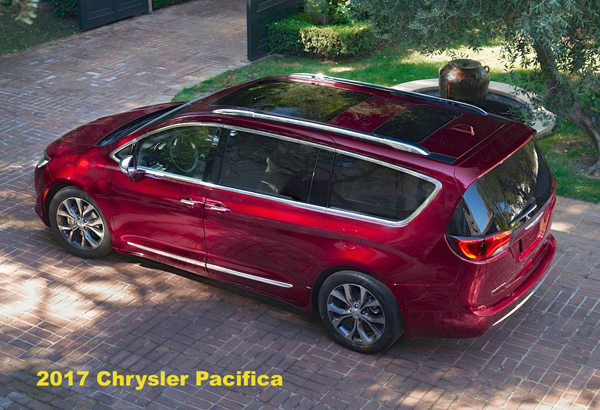 2017 Chrysler Pacifica — yes, it’s a minivan and yes, it replaces the Town & Country. It certainly looks like an improvement over an already good vehicle, but why Chrysler would drop the T&C moniker and resurrect the Pacifica name (last used on a rather drab SUV a decade ago) is beyond me. Please tell me there’s not another Neon in the works. 2017 Genesis G90 — no, I didn’t forget to type in “Hyundai” before the Genesis name. Hyundai is breaking the Genesis line out as its own luxury nameplate, à la Lexus, Infiniti, and Acura. Hyundai… er, Genesis, is looking for Mercedes-type buyers with smaller 401k accounts. And will probably find them. 2017 GMC Acadia — its first overhaul since being introduced for the 2007 model year sees the medium-size crossover 700 lbs. lighter, and shorter in both height and overall length, while still retaining an optional third row of seats. Comes with a new standard rear seat alert that can remind the driver when an item has been left in the second or third row. Like, maybe a kid? Lol 2017 Mini Clubman ALL4 — the rear barn doors remain and all-wheel-drive is now available on Mini’s station wagon-like entry in the small car category. This will probably appeal to those Mini fans who like the AWD idea but needed more room than the Countryman afforded them. See more vehicle debuts at NAIAS.com ### The post WHAT’S NEW? — 2.0 appeared first on Buffalo Cars.